After only a month of trade at my brand spanking new Studio Gallery, Glenelg South, the response from my local community has been overwhelmingly positive and I am so thrilled. Thank you so much to everyone who has managed to make their way down for a visit, it has been wonderful to see a few familiar faces and meet so many lovely people who have dropped by. As many of you know, I have spent much of the past few years preparing to establish a teaching space which would bring community members together by sharing the joy of creating their own handmade jewellery. My plans were small to begin with but, after a generously supported crowd funding campaign and the decision to open a Studio Gallery, my plans got bigger and better than I ever could have imagined. Now finally, I am so pleased to announce that we’ve done it - jewellery classes are now available at Claire Brooks Studio Gallery! The new teaching space is bright and inviting. Students will create their masterpieces on this beautiful table, handcrafted by local furniture designer, Steve Soeffky. As a bit of a taster, I will be running two one day classes before Christmas and I have a whole lot more planned for 2019. 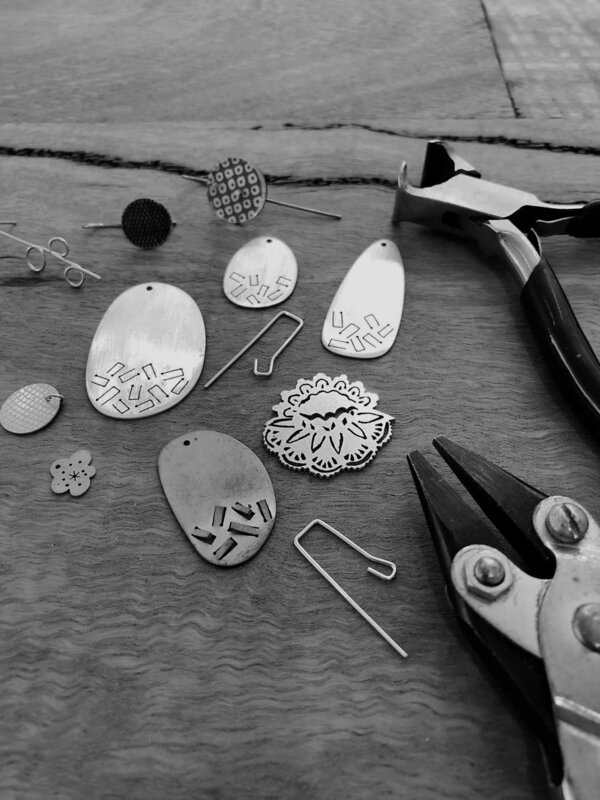 The first two classes are for beginners and will introduce students to the art of handmade jewellery through earring making and the ancient technique of bezel setting. Class sizes are limited to only six people, meaning that you will have plenty of one on one attention and the teaching space is beautifully light filled, leafy and inspiring. In order to run each class I need at least four students, so sign up now and bring a friend or family member. Calling all gemstone lovers! Join me in my beautiful new studio gallery in Glenelg South for this full day workshop and let me teach you how to set your own cabochon stone into a handmade pendant. This course is perfect for beginners or a great excuse for those who have jewellery making experience to get back into basic stone setting. Are you an earring lover who wants to take your collection to the next level? During this class you will work within the intimate, six person workshop space at my new Studio Gallery in Glenelg South, to design and make your own earrings. Each student should leave with at least one of earrings, learning some great skills. Give the gift of creativity this festive season. If you would like to gift a class to a friend or someone you love, please contact me for more details.